Welcome back to our series on quantum measurements from your dearest online physics tutor. In our first post, we threw the concepts of measurement and observation out of the famous Heisenberg uncertainty principle. 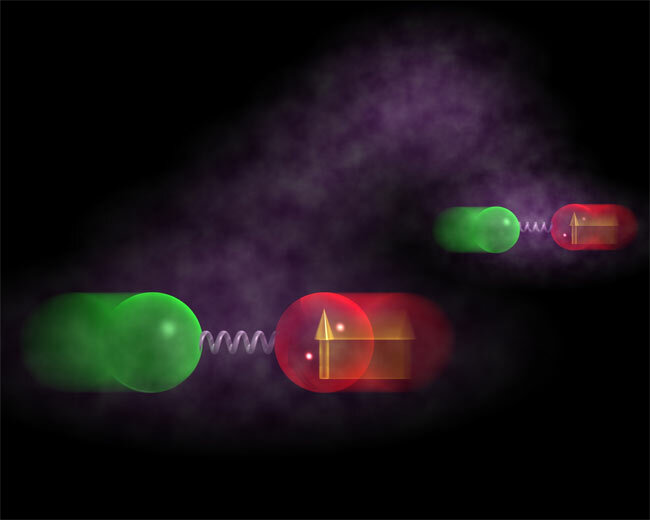 In our second post, we delved a bit deeper into the concept of quantum measurement itself. Now, let’s look at a fascinating example of the use of measurement in modern quantum mechanics and how this might come up in your college academics. Entanglement: It’s like they have ESPN or something. Imagine I have a bag and inside the bag are two poker chips, one red and one green. We both reach into the bag and grab one chip, but we don’t look at the chips we’ve chosen. I cross the street, then open my hand and look at my chip. I see that mine is red, so I instantly know, even from across the street, that yours is green. That is just classical correlation, though. From the moment we made our choice, my chip was always red and yours was always green. The only thing that changed when I looked in my hand is my knowledge of our chips. Now imagine, much like with the quantum coin rom our last post, that these are quantum poker chips. Our quantum poker chips are just like normal poker chips, except that they obey quantum, not classical, mechanics. Specifically, they can be in a superposition of red and green, and are not limited to being purely one color or the other. Now let’s replay our scenario with the quantum chips. After we’ve picked our quantum chips out of the bag, but before we’ve looked at them, both chips are in a superposition of red and green. Each chip has the potential to be red or green with equal probability so, until we measure them by opening our hands, they are both in a superposition of red and green. This correlation between two quantum systems is called entanglement, and our chips are entangled! You might think that this distinctions – between “or AND or” and “and OR and” – are interesting conceptually, but of no real importance. Not so! And here’s why. Picture us standing across the street from each other. We both have our quantum chips in our closed hands, but we haven’t looked at them yet. Let’s imagine first that the chips aren’t entangled, so they can be described by “yours is either red or green AND mine is either red or green.” This might be the case if we had picked from two different bags, each with one red chip and one green chip. In this situation, I would see that my chip is red (or green with equal probability, but let’s say red) and that would be it. Mine would then be unambiguously red, but yours would still be in the same superposition of red and green. Now, let’s go back to the first situation, in which we picked from the same bag and have entangled quantum chips. In this case, our chips are described by “EITHER yours is red and mine is green OR yours is green and mine is red.” Now, if I look at my chip and see that it is red, I make your chip green. Instantaneously, and from a distance, I collapse the state of your chip from a superposition of red and green to a definite state of green only. Let’s look at it another way, keeping in mind that when I say “choose,” I’m not talking about any kind of conscious decision but rather about the random outcome of chance. If our chips are not entangled, then mine has two choices and yours also has two choices. When I measure my chip to be red, forcing it to make its choice, the measurement has no bearing on your chip. Yours still has two options from which it can choose. If our chips are entangled, however, there are only two choices, period, which each decide the state of both of our chips. Red-green or green-red – there are no other options. Therefore, when I open my hand and force my chip to make its choice, I force it to make the choice for both of our chips. Once chance has decreed that mine is red and yours is green, the choice has been made and both of our chips have unambiguous colors. Cool party trick, but what good is entanglement? Good, but slightly cynical, question! Entanglement is fragile – it would take very little, say a stranger bumping into one of us on the sidewalk – to disturb the chips’ entanglement and sever our link. Entanglement is also, at the moment, difficult to generate over large distances. In fact, entanglement is so fragile that my fiancé’s suggested title for this post was “Entanglement – even faster and less permanent than Snapchat.” We compromised with the “Mean Girls” reference (http://www.youtube.com/watch?v=I8caeFYzPxk). Given these limitations, how will we ever be able to use entanglement? We will use it for communication, for computation, and for applications that we can’t even imagine yet! In general, entanglement is the mechanism by which we transfer information from one quantum system to another. If you wanted to build any kind of distributed quantum system, be it a communications system that has absolute security or a quantum computer that will make today’s fastest supercomputer look like an abacus (when it comes to certain problems), you will have to tackle entanglement first. I won’t wax hyperbolic (yet?) on how quantum mechanics is going to fundamentally change certain areas of technology, but it’s certain that generating entanglement and making measurements on entangled systems will be the focus of many interesting results in the years to come. Tune in next time for the conclusion of our series on quantum measurement. We will discover, among many other things, what a Greek philosopher from the 5th century B.C. has to tell us about quantum measurements!